better than i could have imagined: Christmas Decoration Inspiration! 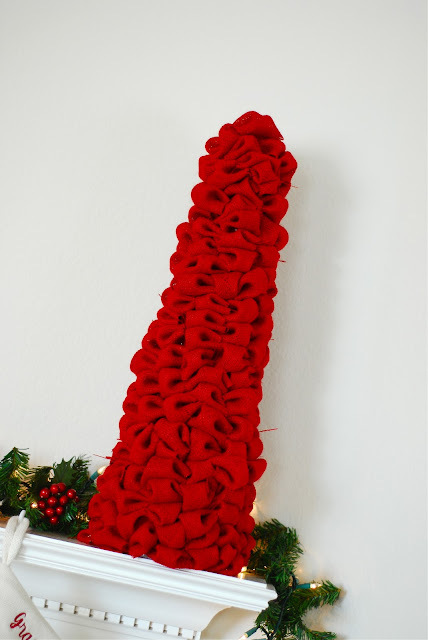 Each year- I suppose I try to come up with a new Christmas decoration to make. This year was no different. And pinterest makes it easy and hard- all at the same time- to choose what to do! 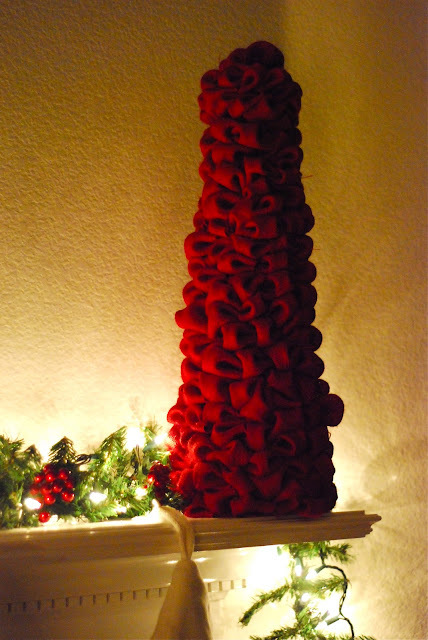 I loved the idea of making this with red burlap. I'm really liking red these days. 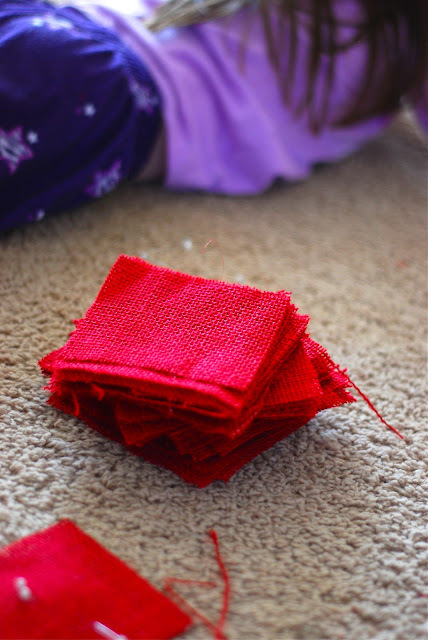 She has a wonderful tutorial and tips for cutting and using burlap. So I cut my burlap squares into approximately 4in x 4in. I think I mate have used 1-1.25 yards. Way more than I thought. And it also took me a little more time than I thought, but I also had to spread it out over a few nights. But- I loved doing it because I was able to really sit down and relax....not focusing on writing or really....not think about anything at all! 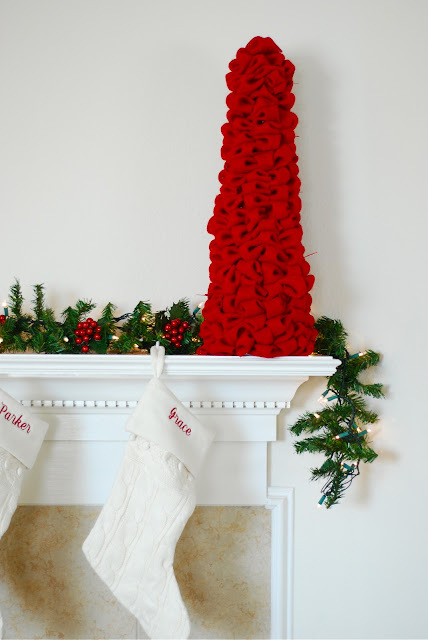 Then tuck the remaining corners in- one by one..
Then stick a sewing pin through the 4 corners....and place in a styrofoam tree (found at crafts stores....and I used a 40% off coupon for mine). The tutorial for the burlap bubble wreath also suggested using your old sewing pins if you have them....and then buy new ones for sewing. I did this and loved the idea- because your pins do get worn out, but it's not one of those things that you always remember to replace because the old dull pins do still work. I wasn't paying attention to her.....when she said, "Look, Mommy! It's J is for Jesus!" The home for this tree right now is on our mantle. I think I like it here. I LOVE all of these colorful balls. It doesn't match our decor this year.....so I did red, white, and silver. But- I am thinking that next year I need to make a switch to more COLOR! We have a clothesline type set up to hang up most of the activities we do throughout the week. I wanted something cheap and easy to display her work for a while, so that we weren't just throwing it away right after she was done. Right now- it is still filled with our Thanksgiving things and when I started decorating for Christmas, I wasn't ready to take them down. I bought this spool of candy cane print wire ribbon a few years back on clearance and have yet to use it until this year. 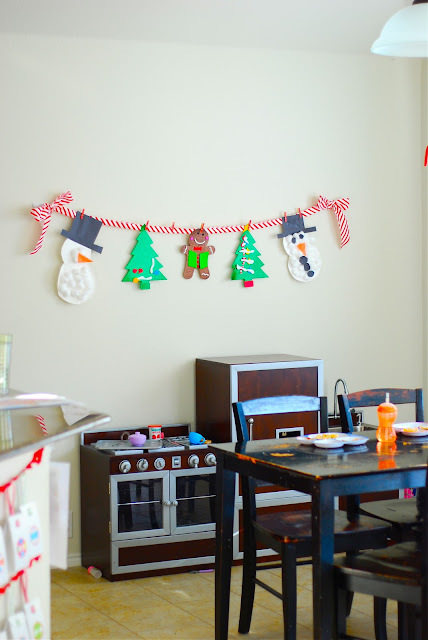 I knew I wanted to display all the Christmas crafts we do this year in one place, and so I came up with this. I love how it turned out. I am using the 3M hooks to hold it up.....and I placed sewing pins where you can't see to hold the bows in place and not unravel when pulled by the weight of the crafts. So far- it has held up well. And lastly- our advent calendar adds a touch of decoration and anticipation for the upcoming Christmas day and celebration of Jesus' birth. I hope to be more organized with it next year, but I would still count this year as a success. The girls (mostly Parker) look forward to it each day. WOW! 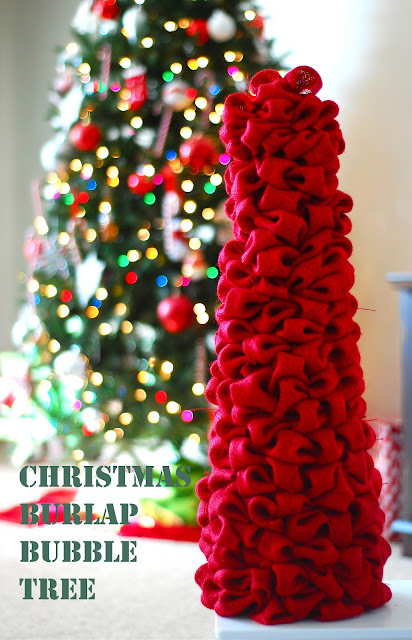 i love the burlap bubble tree, i'm going to have to try that one out! stopping by from gussy sews! merry christmas! 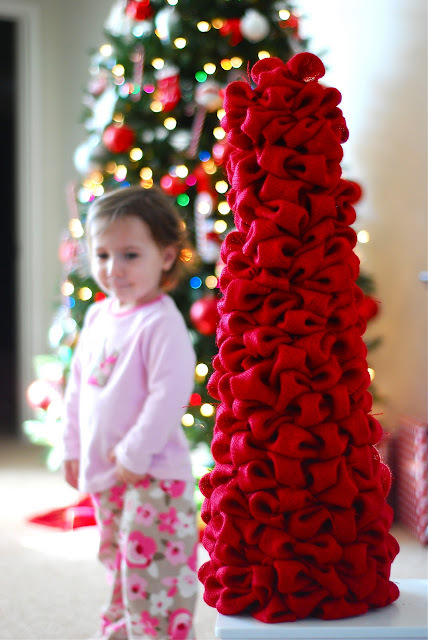 all of these crafts are so cute! 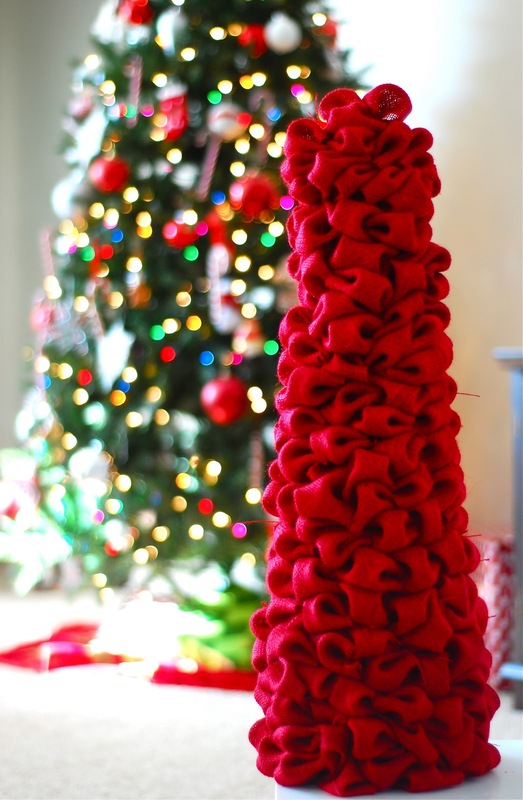 :) I especially love the burlap bubble tree it looks really complicated! I wouldn't tell anyone how simple it is :) lol! 1. Parker looks so much older with her new hair cut. 2. I see our Christmas card up there! Well, aren't you crafty! (which, you really are) I love it all.